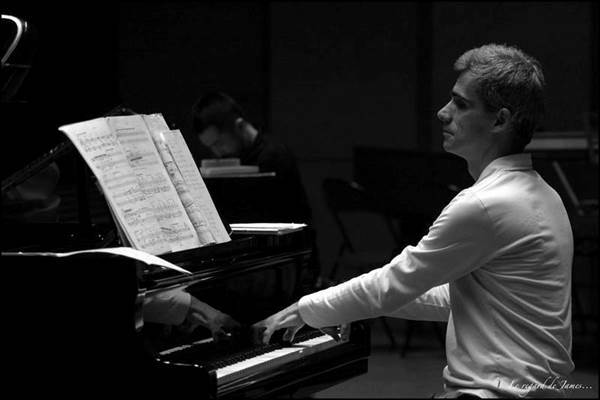 The Greek pianist, Dimitri Vassilakis was born in 1967, began his musical studies at the age of 7, continuing as a pupil of Gérard Frémy at the Paris Conservatoire National Supérieur de Musique, with tuition also from György Sebok and Monique Deschaussées. He unanimously won first prize for piano, as well as prizes in chamber music and accompaniment. Dimitri Vassilakis has appeared as a soloist in Europe, North Africa, the Far East, and America, and since 1992 he has been a soloist with The Ensemble Intercontemporain. He has collaborated with a number of composers, including Iannis Xenakis, Karlheinz Stockhausen, György Kurtág, Luciano Berio and Pierre Boulez, of whose Incises he gave the first performance in 1995. He has taken part in a number of recordings, notably Répons by Pierre Boulez. His festival appearances include the Florence Maggio Musicale, the Warsaw Autumn, Edinburgh, Salzburg and Ottawa, and he has performed in concert halls such as the Buenos Aires Teatro Colón, New York Carnegie Hall and the London Festival Hall.